Sunday Quote!- Spiritual Warfare and Mapping the Land? | J.W. Wartick -"Always Have a Reason"
Sunday Quote!- Spiritual Warfare and Mapping the Land? Spiritual Warfare and Mapping the Land? Spiritual mapping is the practice of identifying the spiritual conditions at work in a given community, city, or nation. By gathering objective information (including key historical facts… locations of bloodshed, idolatrous practices, [etc…]) and combining it with spiritual impressions (prophecy, revelation, words of knowledge, dreams, and visions), believers can prayerfully combine all of this information and draw a map that identifies the open doors between the spiritual world and the material world (182-183, cited below). Now I admit that I come from a background in which spiritual warfare was little (if at all) discussed, but this does seem a little bit more than we can glean from the biblical image of spiritual warfare. Where, for example, are we instructed to try to use dreams and revelation in order to find “open doors” of the spiritual world? Where are we instructed that there might be doors for the spiritual world into our own that are identifiable? I think some aspects of this notion might be helpful for witnessing and the like–after all, knowing the landscape in this fashion would be helpful for identifying areas of conflict in a community and offering Christlike compassion in those areas–but I hesitate to think that the way they can be applied is in this fashion. What are your thoughts on this? What do you think of spiritual warfare? Again, I highly recommend this book with its very wide range of diverse views presented on the topic in order to get an introduction. 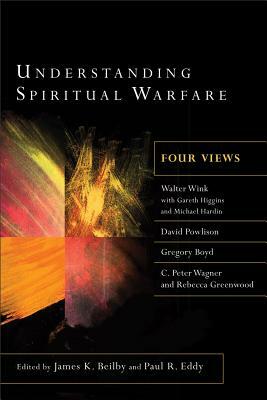 Microview: Understanding Spiritual Warfare: Four Views– I briefly review this highly interesting book on different views of spiritual warfare. C. Peter Wagner and Rebecca Greenwood, “The Strategic-Level Deliverance Model” in James Beilby and Paul Rhodes Eddy, eds., Understanding Spiritual Warfare: Four Views (Grand Rapids, MI: Baker, 2012). « Really Recommended Posts 1/30/15- early Christianity, Neanderthals, and the church!